Governor Terry Branstad signed a bill into law today which increases a state tax credit for volunteer fire fighters and EMTs, and expands the credit to apply to reserve peace officers, too. “I personally have benefitted from those services as I know literally hundreds of thousands of other Iowans have,” Branstad said after a bill signing ceremony in a West Des Moines fire station. Branstad paid tribute to a team of volunteers who responded to a wreck on a black top road in northern Iowa 34 years ago. The front end of Branstad’s car was crushed and Branstad — who was Iowa’s lieutenant governor at the time — was knocked unconscious. Exactly one year earlier, on October 30, 1978, the landing gear on Branstad’s campaign plane would not engage, so the pilot had to make what Branstad describes as a “hard landing without wheels” at the Sioux City airport — but Branstad and the others in the plane were able to walk away from that crash. 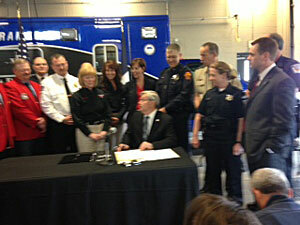 Branstad has signed a proclamation declaring next week as Emergency Medical Services Week in Iowa.